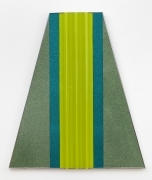 ROBERT SMITHSON, Fling, 1965, Green plastic panels on wood, aluminum stripping, 48 x 42 in. ROBERT SMITHSON, Quick Millions, 1965, Red, glitter, light blue, black plastic panels, 54 x 56 in. ROBERT SMITHSON, Untitled [Classical head], 1963, Mixed media with collage on paper, 30 x 22 in. ROBERT SMITHSON, Untitled [Venus with lightning bolts], 1964, Pencil and crayon with collage on paper, 30 x 22 in. ROBERT SMITHSON, Untitled [Pink linoleum center], 1964, Collage and color pencil on paper, 30 x 22 in. 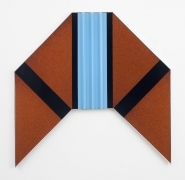 ROBERT SMITHSON, Untitlted [Ziggurat], 1966, Paint on metal, 23 x 23 x 19 in. ROBERT SMITHSON, Four-Sided Vortex, 1965, Steel and mirror, 35 x 28 x 28 in.